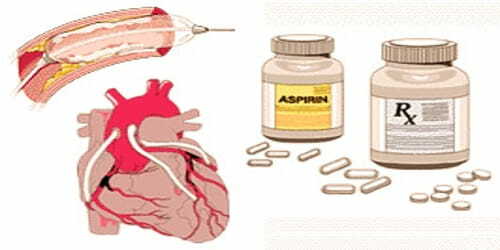 Definition: Coronary artery disease (CAD) is the narrowing or blockage of the coronary arteries, usually caused by atherosclerosis. CAD also is known as ischemic heart disease (IHD) is the most common of the cardiovascular diseases. A common symptom is chest pain or discomfort which may travel into the shoulder, arm, back, neck, or jaw. Occasionally it may feel like heartburn. Usually, symptoms occur with exercise or emotional stress, last less than a few minutes, and improve with rest. In many cases, the first sign is a heart attack. Other complications include heart failure or an abnormal heartbeat. Coronary artery disease starts when people are very young. Before people’s teen years, the blood vessel walls begin to show streaks of fat. As they get older, the fat builds up, causing slight injury to their blood vessel walls. Other substances traveling through their bloodstreams, such as inflammatory cells, cellular waste products, proteins, and calcium begin to stick to the vessel walls. The fat and other substances combine to form a material called plaque. Risk factors include high blood pressure, smoking, diabetes, lack of exercise, obesity, high blood cholesterol, poor diet, depression, and excessive alcohol. A number of tests may help with diagnoses including electrocardiogram, cardiac stress testing, coronary computed tomographic angiography, and coronary angiogram, among others. Nuclear Imaging produces images by detecting radiation from different parts of the body after the administration of a radioactive tracer material. Ultrasound Tests, such as echocardiogram use ultrasound, or high-frequency sound wave, to create graphic images of the heart’s structures, pumping action, and direction of blood flow. Radiographic Tests use x-ray machines or very high tech machines (CT, MRI) to create pictures of the internal structures of the chest. 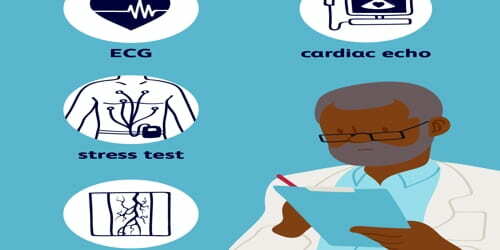 There are various risk assessment systems for determining the risk of coronary artery disease, with various emphasis on different variables above. A notable example is the Framingham Score, used in the Framingham Heart Study. It is mainly based on age, gender, diabetes, total cholesterol, HDL cholesterol, tobacco smoking, and systolic blood pressure. 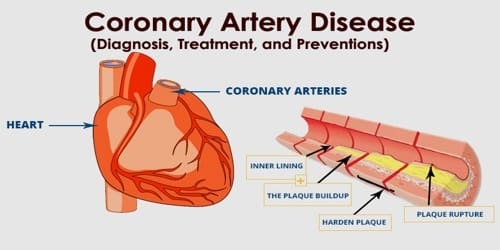 Treatment of coronary artery disease involves reducing patient’s risk factors, taking medications as prescribed, possibly undergoing invasive and/or surgical procedures, and seeing their doctor for regular visits. Treating coronary artery disease is important to reduce their risk of a heart attack or stroke. A surgeon creates a graft to bypass blocked coronary arteries using a vessel from another part of the patient’s body. This allows blood to flow around the blocked or narrowed coronary artery. Because this requires open-heart surgery, its most often reserved for cases of multiple narrowed coronary arteries.